Everybody has written one, so it’s my turn. It’s taken me a few days though, and I’m not sure why. I suspect it’s because I’m ambivalent about where Israel is headed with Judea and Samaria/West Bank. It’s also a long piece, so grab a cup of tea. The conventional wisdom of the seventeen thousand two hundred and eight Six Day War editorials that have been written over the past couple of weeks tells us that in many respects this victory has brought with it an armload of problems that have rendered the victory an actual loss for Israel. Editorialists refer to the ongoing war with the Palestinians, how Israel still has to deal with the animosity of the Arab and Islamic worlds, and the burden of the “occupation” as the key issues plaguing Israel because of the Six Day War. Some writers have suggested that Israel was the aggressor in ’67, or did not control itself appropriately in the face of mild or benign threats from the Arabs. I tend to agree with some of the explications, though not all. I didn’t expect to have to write a background but after reading a BBC overview of the war that manages to place the blame for the war on the IDF’s leadership, I thought I might as well include it. The first thing to remember is that in the weeks leading up to the war, the Egyptians had whipped themselves into a frenzy that overtook the Arab world. The intent of this mass movement was simple: Israel shall be destroyed in this war. Let’s be clear, this wasn’t a movie or a game. They wanted to destroy the state of Israel and nothing less. The leader of the brave and strong Arab nation was Nasser and one by one other leaders of the Arab world, following mass demonstrations of support by their people, committed themselves to supporting Egypt. Thus, King Hussein of Jordan signed over his forces to Egyptian control and King Fahd of Saudi Arabia offered his support and sent 20,000 troops to Jordan. Israel was surrounded by enemy states from every side and the Arab message came loud and clear across the airwaves. For example, Egyptian radio kept sending, in Hebrew, messages to Israelis promising that Israel would be ground to dust. Fear in Israel was deep and palpable to the point where burial plots were prepared. The BBC lays the blame for this fear at the feet of the IDF which, according to this venerable news organization, for some mysterious reason decided not to tell Israelis their army was strong. This is ridiculous. To a far greater degree than now, the IDF was a people’s army. Officers and soldiers came from the society itself and the notion that some sinister secret strength could be withheld from the people is absurd, not to mention contrary to the interests of the IDF. If the BBC needs further proof, they need only look at the euphoria and confidence projected by Israelis after the Six Day War when they were confident of their army’s strength. Back to the fear. At the time, 1967, the state of Israel was only 19 years old! It was still relatively poor and struggling to develop its economy, political standing in the world, and its definition of itself. It had lost both Russia and then France as patrons and was in the early and untested years of its relationship with the US as a patron. Despite success in the ’56 campaign, it had run-ins going back years with Arab states as well as Palestinian fedayeen that had been ongoing prior to ’56 and more rarely thereafter. Suddenly facing the removal of UN peacekeeping forces from the Sinai and the oncoming movement of Egyptian divisions (100,000 men) toward the armistice line made the sense of an imminent war impossible to ignore among Israelis. The news broadcasts, the Egyptian propaganda and the numerous new refugees – most from Arab countries and personally familiar with the hate and violence directed at Jews and Israel – that Israel had absorbed since winning the ’48 War of Independence, drove the public mood of fear. Along with the threatening troop movements, the Egyptians closed the Straits of Tiran to Israeli shipping, closing off supply lines to Israel. This was, officially, casus belli, but war didn’t come about immediately. Although the frenzy in the Arab world and Nasser’s ongoing declarations about the destruction of Israel were frightening to the public, the decision to go to war was taken only after lengthy deliberations over a period of weeks and after cautious waiting on the part of Israel’s Prime Minister, Levy Eshkol. Eshkol, unlike today’s Olmert with his Lebanon failure, took many days to make a decision to go to war and held off the IDF’s General Staff even as they encouraged him to strike first. The General Staff’s reasoning was simple: war is inevitable and whomever shall strike first will hold the advantage; Israel cannot afford to wait. Eshkol waited. Part of what weighed heavily on Israel was the knowledge that while the two superpowers, Russia and the US, each stood behind their champions, the US refused to take an active role in supporting Israel. In fact, the Americans refused to put their own forces to use in order to open the Straits. Just the appearance of a warship might have done it, but the Americans were fatigued with Vietnam and didn’t wish to become directly involved in a Mid-East conflict. When pushed by the Israelis, their refusal made it apparent that if Israel took matters into its own hands, they would not directly participate but also wouldn’t stop the Israelis. Their intelligence assessment was that Israel would win a war against the Arab states. What finally turned the tide in Israel to war was a poor radio speech Eshkol had given with the intention of calming the populace. 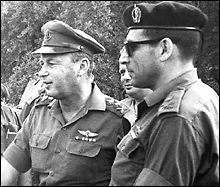 In direct contrast with Nasser’s heroic, bombastic speeches, Israel’s leader stuttered and made a couple of critical errors that made him appear incompetent to lead war. His leverage over the IDF at the time was that aside from the PM seat, he also held the Defense Ministry portfolio. After the speech, he lost such standing that he felt compelled to hand the Ministry to Moshe Dayan who was perceived as a cool and collected military leader. The decision to go to war was made soon thereafter. As we all know, Israel destroyed the Arabs’ air forces within hours of attacking on the morning of June 5, 1967. Well prepared for the war by Yitzhak Rabin who was Chief of Staff at the time, and guided by Dayan who already possessed successful experience against the Egyptians from the 1956 campaign, the armor and infantry divisions quickly overtook the Arab forces on the battlefields and defeated them handily. Israel asked the Jordanians to refrain from attacking, but Jordan attacked Israel anyway. At the time, Jordan was in its 19th year of occupying the West Bank and had a well trained army. It didn’t matter much because Israel overcame Jordanian resistance rapidly. 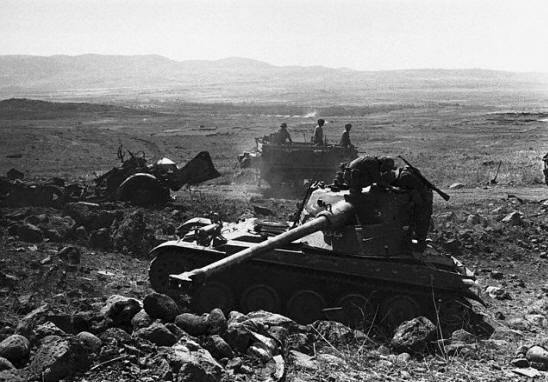 Syria was also attacked and the Golan Heights were conquered. Israel lost around 800 soldiers in that war but estimates for Arab losses usually exceed 10-20,000 soldiers. Virtually all of the Soviet equipment used by the Arabs was destroyed, including hundreds of airplanes, dozens of SAM systems and countless tanks. The outcome of the war from Israel’s perspective was the acquisition of additional land, namely the Sinai Peninsula, Gaza (which had been under Egyptian occupation for 19 years), Judea and Samaria (called the West Bank because it was the West Bank of the Jordan River and had been under Jordanian occupation in 1948-1967) and the Golan Heights as well as Mount Hermon. Israel’s size trebled in one week. East Jerusalem also came under Israel’s control, and for the first time since 1948, Israeli Jews could visit the Western Wall, regarded as the wall outside of the holiest site in Judaism, the destroyed Temple. The Western Wall, in the Old City, also represented a return to a part of Jerusalem that had seen all of its Jews evicted in 1948 despite having represented a majority of the Old City’s population as far back as the early 1800s. The term “Arab East Jerusalem” actually misrepresents the modern history of east Jerusalem and particularly the Old City severely. Upon re-entering the city, the Israelis learned that under the Jordanians, the Arabs destroyed all Jewish synagogues and burial sites, often using the stones as slabs for walkways. 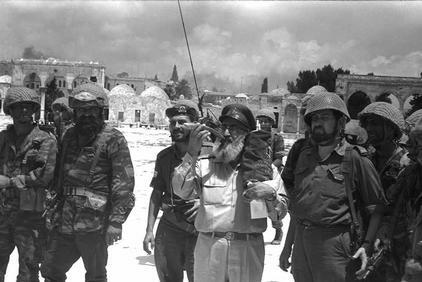 Immediately following the war, Moshe Dayan handed the “keys” of the Temple Mount to the Waqf, the Islamic institution in charge of the two mosques and site at the top of the Mount which the Muslims call the Haram al Sharif. Also very rapidly, the Israelis destroyed over 100 houses (they offered compensation to the Arab inhabitants who were given no choice in the matter) in the neighborhood built up to within a few feet of the Western Wall and opened the area up into a plaza in front of the Wall that we all know well from photographs. Some authors make a big deal of this, but I fail to see the issue: governments use eminent domain rules to purchase land they need for public purposes all the time. The holiest site in Judaism holds greater public value than a 100 houses. Israel also annexed east Jerusalem and it soon became a mantra among all Israeli politicians, military leaders and most Israelis that Jerusalem shall never again be divided. Ehud Barak was the first, and still the only, Israeli PM to agree (in 2000, at Camp David and then in 2000/2001 at Taba) to a formula that divides the city and removes control of parts from Israeli hands and hands them to the Palestinians. People who seek to undermine the importance of the offer Israel made at Camp David and than at Taba severely understate the importance to Israel of breaking this taboo of “dividing” Jerusalem. 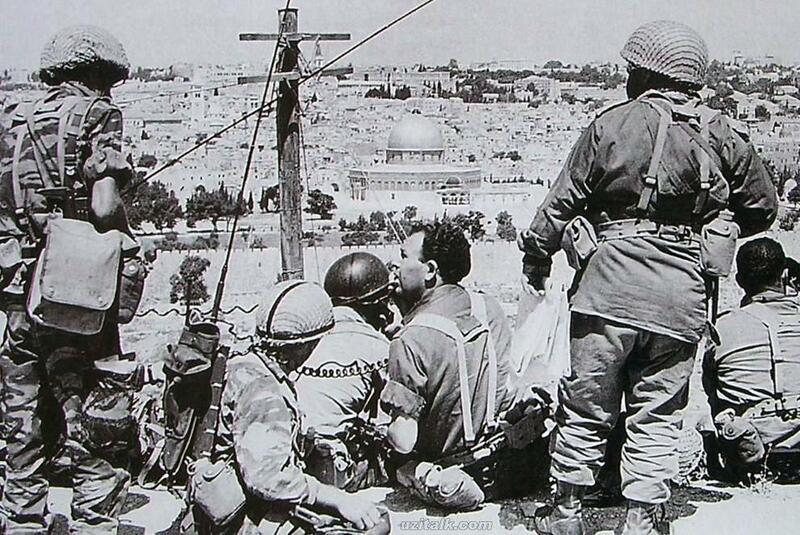 On June 19, 1967, the Knesset voted in favor of exchanging land conquered in the war for peace with the Arabs. Israel’s hand was extended in peace. 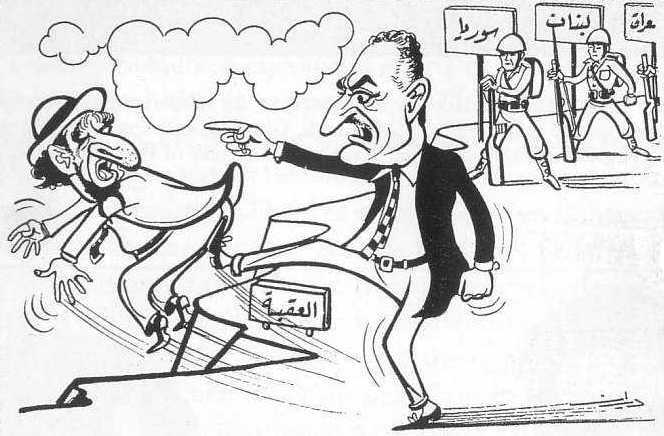 However, although most Israelis assumed that land acquired in the war would soon be traded for peace and acceptance by the Arab world, these hopes were quickly dashed by the hero’s reception Nasser received despite the humiliating defeat, and his determination along with that of other Arab leaders not to add to the humiliation by negotiating with Israel. Thus, when the Arab League met in Khartoum in September, to the disappointment of the Israelis it declared that they wouldn’t recognize Israel, wouldn’t negotiate with Israel and certainly wouldn’t make peace with Israel. I don’t know that they even used the word Israel in the speech. These are known as the “three nos” of Khartoum. With the hopes for exchange of land for peace dashed, and possessing the euphoria of re-acquiring the holy and historic sites of Jerusalem and Judea and Samaria, the Israelis paid little heed to a small group of organized individuals who immediately set out to establish early settlements in these areas. Within one year of the war, almost 1000 Israelis had moved to parts of the West Bank that were not in or around Jerusalem. Disciples of Rabbi Avraham Kook, a forceful leader who was outspoken about the holiness of Judea and Samaria, these men and women were committed to developing and keeping the cradle of Jewish history as part of any Jewish state. They were quick to move and were dedicated to their cause at a time when the politicians were still trying to figure out their own positions and learning from the Arabs that their positions were unchanging. Over time, and particularly with no peace settlement in sight, Israeli governments of the Left and Right would support the settlement movement despite international laws prohibiting settlement on occupied land. Legally – although one senior legal advisor to the government of Israel indicated it was illegal – the Israelis took the position that the territories that were under the British Mandate prior to 1948, were disputed and not occupied. This was not a weak argument. The land had previously been under Ottoman rule and then under British Mandatory rule with the mission of the mandate, as defined by the League of Nations, to develop a home for the Jewish people. There had never been an Arab state there and the notion of control had been defined by the conquerors of the land over time. One could even say that the key reason this land has been considered “Arab” since 1967 was that in the ’48 War, the Jordanians conquered it. However, when the Jordanians sought to annex this land, they were denied by the international community, just as the international community would reject (and still does) Israel’s annexation of east Jerusalem (in fact, incredibly, the international community doesn’t even recognize west Jerusalem as belonging to Israel). Another outcome of the War was the important UN Security Council Resolution, 242, which as all Security Council Resolutions (and in contrast with General Assembly resolutions) carries the weight of international law. UNSCR 242 declared that “territories” would be given up by Israel once surrounding enemies recognized and accepted Israel in peace. The intention of the resolution was to give Israel some wiggle room in future negotiations so that it wouldn’t have to return to the same 1967 borders that had been so dangerous and unstable in the first place. The language of 242 purposely omitted the word “the” in front of “territories” (it took weeks of negotiations to compose this resolution, according to participants) to indicate that not all of the acquired land needed to be given up. Russia and France rejected this idea and translated the Resolution into their languages using the term “the territories” but English was and is the controlling language. With or without Resolution 242, the Arab declaration in Khartoum meant that the state of belligerence would continue. In the absence of peace, the vacuum in the newly acquired territories was filled by those idealists who sought to build communities in the West Bank. Gush Emunim was a very active movement at the time and the seeds they sowed are the ones which Israel reaps today. Many would say bitterly. However, the story was different in Jerusalem where the Israeli government sought to re-establish Jewish presence in the parts of Jerusalem that had been held by the Jordanians since 1948. New neighborhoods were built and the old Jewish Quarter which had been entirely destroyed by the Arabs was rebuilt from scratch. The plan that would take shape over decades and is still ongoing was to establish neighborhoods for Israelis that would ring the city or abut Arab neighborhoods. The goal involved ensuring a Jewish majority as well as control of the available land. Although east Jerusalem’s Palestinians were able to take on citizenship in Israel, virtually all have rejected this option in favor of resident status. As such they benefit from Israel’s welfare, health and other laws as would any citizen and they pay taxes, but they cannot vote in elections. This enables the Israelis to maintain a demographic fiction about how many Jews and Arabs live in Israel and in Jerusalem. Of course, the Palestinians do the same, labelling all the Jews who live in new and old neighborhoods around Jerusalem “settlers.” The BBC and many other news organizations agree with this form of counting. If you read that there are approximately 250,000 settlers, then you are reading an article that respects the non-settler status of Israeli Jerusalemites. If you see a count of 450,000 settlers, you are in a pro-Palestinian zone. Congrats. Forty years later, we can reflect to some degree on the meaning of the victory of Israel in this war. Unfortunately, the view is still murky since some matters have yet to be resolved. First and foremost, it is important to note that the overwhelming victory gave Israelis and their supporters around the world a sense of euphoria and a confidence in Israel’s mission as a Jewish homeland as well as the confidence that the state was a fait accompli. No longer would its existence be in doubt because the one-side victory proved that the country could not be taken down by its enemies. There is another element of this which I am too young to remember but which has been described to me as powerful and deep pride in the Israelis by both Jewish and Christian supporters. Israel and its army became almost mythical in the eyes of many for a time. While many of the warm feelings would remain, a war of attrition would soon follow, with one or two Israeli soldiers getting killed almost daily. Later, the confidence in Israel’s invincibility would be further eroded by the ’73 War when Israel suffered heavy losses and was within days of being overwhelmed by the Arab armies in both the Egyptian and Syrian fronts. This led to a serious crisis in confidence in the Israeli government and brought down what had been a string of Left wing governments so that in 1977, Menachem Begin became Prime Minister. Ever since, we have seen governments on the Right win elections or perform extremely well. Of course, we can make a strong claim that Egypt made peace because of the damage inflicted upon it in ’67. In exchange for peace, they received the return of every last inch of the Sinai, plus a strong commitment and eventual relationship with the US that included arms supply and financing for those arms. Jordan also made peace after Oslo began, in large part because it became clear that its future lay on the east bank of the Jordan River. During Oslo, the Jordanians officially handed off “ownership” of the West Bank to the PA.
Peace with Syria has been more difficult to achieve. They have been very belligerent over the years, but there have also been close calls for peace. If Rabin hadn’t been killed, he might have closed a deal. Barak was planning on doing a deal but then turned his attention to the Palestinians. Netanyahu admitted a couple of days ago, for the first time, that he also negotiated with the Syrians about peace in exchange for the Golan Heights minus Mount Hermon. And now Olmert is talking to them. Anybody who has seen the Heights and where they are situated can understand the reluctance of Israeli governments to give up this critical and formidable strategic asset. Further impeding the deal is the presence of Mount Hermon nearby, which Israel uses for defense purposes because of its size and location, as well as the Syrian demand not only for the entire Golan Heights, but also control of land down to the Sea of Galilee as well. Forty years after the war, however, Israel’s biggest challenge comes from the Palestinians. The Six Day War, for the first time ever, galvanized them as a people. Ironically, it was Israel that brought this situation about by providing a kinder, gentler occupation than did the Egyptians and Jordanians. Infant mortality improved dramatically as did life expectancy and per capita income. The Israelis established hospitals and universities and provided jobs. Many Palestinians would eventually find themselves working at construction jobs that not only built up their areas, but also built up Israeli settlements in the territories. In coming into contact with Israelis so closely, the Palestinians also seemed to see the human weaknesses involved and have effectively taken advantage of some in these years of conflict. I like to think they also learned about democracy from their direct interaction with Israel. Finally, and perhaps most important, a strong whiff of nationhood hit the Palestinians because Gaza and the West Bank were both under Israeli control and their work in Israel enabled travel to and fro. Previously, the Palestinians had lived under separate harsh occupation regimes (Egyptian in Gaza, Jordanian in the West Bank) and prior to ’48 nationalism was not a burning issue for them. However, after the Arab armies’ defeat in ’67, the sense that the Palestinians needed to care for their own plight rather than leaving it to the very Arab armies that had created their mess in the first place became more prominent and the interaction between the populations of the two territories further enabled this sentiment and fueled their nationalism. The Israelis offered the Palestinians a non-Arab, non-Muslim target of hate. Slowly but surely the Palestinians began to form nationalist groups. The PLO attained strength and prestige and took a leading role within the society even if it was far away in Jordan and then in Lebanon and eventually Tunisia. While terror attacks had always been perpetrated, soon after the war the attacks became more sophisticated and deadly. They became a signature of the Palestinian terror groups who took their fight internationally with numerous plane hijackings and other attacks against international and Jewish targets. The success of these attacks was to put the Palestinians on the international map. The UN would invite Arafat to speak to its assembly and gave the Palestinians special observer status which, for instance, the Kurds which unlike the modern Palestinian nation are an ancient one, have never received. Lesson learned: terrorism pays, and; pays extremely well when the intended political target is Jewish. By 1987, the Intifadah broke out in the territories and Israel found itself fighting a war entirely opposite to the type of war that it fights best – army against army. Here they were fighting a Palestinian nationalist movement that had religious undertones. They were fighting insurgents and guerrillas. They were also fighting a propaganda war and the Palestinians successfully put their children at its forefront. Soon, the Israel of 1967, perceived as David, became perceived as a particularly ogrish Goliath. The Oslo accords attempted to have the Palestinians become either autonomous or part of a new state residing next to Israel. Hopes were dashed with Rabin’s murder by a fanatical Jew with “Greater Israel” leanings, Netanyahu’s ascendance and eventually the Palestinians’ refusal to negotiated for a state in 2000. Yes, this is a short version of what happened, but accurate. 2000, in fact, led them to their next war, one that is still being fought today. Again they used their children for media purposes, but because of Oslo they now had guns. Years of experience as terrorists provided them with bombs (ususally strapped to a person). This was a brutal and deadly war where Palestinians target(ed) civilians, while ensuring their civilians were also in harm’s way for defensive and propaganda purposes. Although Israel has the upper hand militarily and geographically, the Palestinians have managed to have lots of babies. Demographics scare the Israelis. Seeking to remain the majority in a Jewish state that is democratic, the Israelis were always sensitive to the issue of Palestinian population growth. Within Israel’s Green Line borders (the Green Line is the armistice line of ’48), Jews have traditionally been 80% of the population. That number has held up despite Israeli Arabs’ high birth rate because Jewish Israelis also have lots of children and because of aliyah from foreign countries. However, if one ignores the Green Line and simply counts the number of people from the ocean to the river, the Jewish majority becomes smaller and may fall under 50% for voting age individuals within several years. Demographics are probably the strongest reason that Israel has not annexed the West Bank or Gaza, and that even Arik Sharon was willing to put up the Security Barrier despite fears that a de facto border would be created and that all of those Israelis east of the fence would end up moving west. The security barrier means the end of “Greater Israel” as does the unilateral return of Gaza. Demographics drove these changes even among some hard-line settlement supporters. Arafat famously told Palestinian women that their wombs were weapons, and the reasons behind the Palestinians’ rejection of the peace offers of a state in 2000 amount to little more than a delaying tactic. The presumption is that at some point, they will turn the debate from a two state solution to one over a single state solution. All the talk about “apartheid” is merely a precursor to a debate about the meaning of a “land for two peoples” and is the strongest arrow in the quiver of those who seek to destroy the Jewish state of Israel and make it into yet another Arab state. Until 1967, the Israelis were heavily focused on establishing themselves economically, bringing in Jews from across the world and absorbing these new immigrants (many of whom were refugees who had left all behind), and its survival as a state in a hostile area. As a tiny state surrounded by large and more populous states, tension has always been a part of life for Israel. 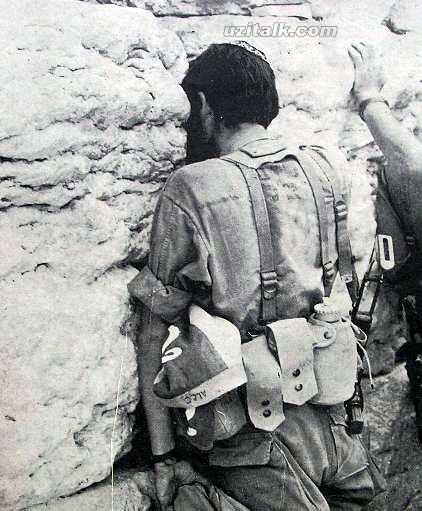 The ’67 War, whether it was driven by the Soviets, or driven by Arab desires to attack, was perceived by most Israelis as an extension of the ’48 War – nothing less than a struggle for life or death. One can almost hear the national sigh of relief, and then the resulting joy, when the war was won by Israel and especially in a lopsided victory. The joy was infused with the confidence that the Arabs would have to make peace now and the longed-for peaceful future for Israel would finally arrive. These views would be important in the coming years and would be further reinforced by the ’73 War launched by the Arabs with brand new Soviet equipment. If you can’t have or negotiate for peace because of your enemy’s stridency, then you have to take care of your own and to hell with the enemy. If anything, I have to think that this is one of the driving forces behind the slow but inexorable growth of the settlements and the settlement movement inside Gaza and the West Bank/Judea and Samaria. There was a feeling that there was nobody to talk to, that peace was a hazy mirage in the distance, and that it’s not as if these new lands weren’t extremely relevant to Jewish history and identity anyway. In combination with Israel’s pre-’48 history of establishing settlements on purchased land to establish outposts and facts on the ground, it must have seemed extraordinarily tempting to build the settlements. After all, this was considered disputed land with Jordan, not Palestinian land, and the Jordanians had attacked and lost and then refused to even recognize Israel to negotiate. It was also the cradle of Jewish civilization. The settlements grew, slowly but surely. Israel put its resources into expanding Jerusalem, unifying it geographically and renovating the destroyed Jewish Quarter as well as the plaza in front of the Western Wall. It also, however, had hundreds of thousands of Palestinians who now fell under Israel’s authority. The army had to remain in the area even as Israel needed to govern. While they built facilities such as hospitals and universities for the Palestinians, the Israelis also maintained a military presence among them. This was not a brutal occupation, but it was nonetheless one people with guns and tanks lording over another people without those weapons. The nature of the military with its young conscripts also meant that you might have a 19 year old Israeli soldier dictating a situation to an older, respected Palestinian. Alarm bells were rung. People like Yeshayahu Leibovitz, a brilliant man who was a devout Jew and a superb scholar, spoke out against the occupation warning that it would change the face of Israeli society; that there was no way to occupy without corrupting the occupier. But the settlements grew. Voices like Leibowitz’s were not in the mainstream. Overt and covert funding and support for settlements came from the government of Israel even as the Palestinians were discovering their own nationalism and becoming angrier and angrier at the Israeli presence in their midst AND its needless reminder of their own lost homes within Israel proper. Of course, we know what happened next with the Intifadah of 1987, the Oslo Accords of 1994 and then the slow decline into suicide bombing terror and eventually into a full-blown war that was launched in 2000 even after Israel accepted and offered peace and a two state conclusion to the conflict. The Six Day War created this monster, the occupation of the Palestinians, that has sapped Israel’s strength over a period of decades, undermined its own sense of legitimacy and has opened the door to ceaseless and strident international criticism of Israel which has now evolved into heinous attacks against not just Israel but its supporters and Jews in general as well. But the War also gave Israel the power to negotiate peace with Egypt. Admittedly, this has been a disappointing peace on many fronts, and Israel is probably extremely worried about Egypt’s future relationship with it, but it has held for 30 years now. Of course, the price was the Sinai which had been conquered in ’67. Most people assume that peace with Syria will be achievable using a similar paradigm regarding the Golan Heights. Even if it doesn’t, Israel has been far more secure in its north because they took over the Golan Heights which are strategic in many respects. Economically, the Heights have not been of great benefit, but they have been important for military needs as well as the sense of space given to Israelis in their tiny country. The Six Day War also gave the Israelis the confidence to believe in themselves and to build for the future. If they had doubts in their first 19 years, the War dispelled them for both the secular majority and the devout minority. It gave the country a new state of mind, one brimming with confidence, to build the future without fear – after all, the country would be sure to win future wars. A new chapter could now begin, one that would finally break the continual struggle from the early days of political Zionism to establish the state. The new chapter was about being assured that the flag has been planted and Israel was an unchallenged reality. It was about moving forward to making peace with neighbors and moving on from pioneering work to renovation and the setting down of permanent structures. The future looked much clearer for all. Little did the Israelis know that their new chapter would also be a new chapter for the Palestinians. The Palestinians we know today, both in the manner they relate to Israel and to each other, were born of that War. And so, oddly, a war between states that barely touched the Palestinian Arabs, ended up being a war that gave them a rebirth and defined the very struggle between the Palestinians and Israel. This was a re-definition of a century-long war between two peoples over the same piece of land but in this incarnation, the Jewish side held the superior hand. Israel’s offers in 2000 and 2001 at Camp David and Taba, were Israel’s effort to end this cycle of the conflict with a fair resolution. In reality, it is the only resolution short of a cataclysmic war that would be fair since Israel will never concede the Western Wall or the Jewish Quarter in the Old City. If only the Palestinians would come to accept this resolution in good faith, perhaps Israel and they could start the third chapter in this story as partners in peace. Well done on a very comprehensive overview of the factors leading to the Six Day War and its aftermath. Your early comments about the BBC and its tendency to rewrite the facts to blame Israel for the war were spot on! I haven’t seen the BBC coverage (and have little desire to), but if your description of it is correct, they’re almost alone in claiming Israel shouldn’t have fought the war. Indeed, one of the striking things about the 6/40 verbiage is consensus around the way the war unfolded, and the gains for Israel. Perhaps never again will Israel face a threat to its existence by a group of states under the pan-Arab banner. As for the occupation: it raises the question what, if anything, Israel could/should have done differently. This is irreducibly speculative, of course. Seems to me, though, that Israel enjoyed a position of unquestioned military dominance in the wake of the war– strong enough to have imposed its own solution on the territories, irrespective of the Arabs’ ‘nos’. Having offered land for peace, and the Arabs having rejected the offer, Israel could have decided what land it needed for its security, and disposed of the rest, at least on an interim basis, through some form of local autonomy or self-rule. Instead, there was the long, morally damaging equivocation by successive governments over the settlements. Has Israel, even today, decided what it really wants? A religiously-based Greater Israel on all or part of the West Bank? A minimally-augmented version of the 1967 borders, for security reasons only? Oops- more in a bit…. Back to the failure to have revised borders in 1967 (or to have annexed the entire West Bank): Israel’s insistence on an Arab or (later) Palestinian interlocutor, her demand to be recognized and accepted before the permanent status of the territories is decided, has been a great mistake and a failure. After taking ‘nos’ for an answer, Israel hunkered down and made a dangerously unresolved status quo on the West Bank substantially worse through the settlements. All the while, Israel insisted the Palestinians overhaul their culture– change the PLO charter, alter their textbooks and maps, eschew anti-semitism (an overhaul arguably more likely after peace rather than before it) while Israel put off the hard choices confronting it in the territories. Hasn’t this been self-defeating? Not per se ignoring Hamas, for example– but employing Arab dysfunction and hostility as a crutch and an excuse, to delay the inevitable final reckoning over what “Jewish state” really means? And if one takes, say, Netanyahu’s quite plausible position on the need for profound Palestinian reform–well, there are real people with legitimate interests and rights on the West Bank, who are owed a decent present and a livable future. Israel’s not going to make them citizens, right? What’s to be done with them in the meantime, during the protracted, perhaps multi-generational period during which deep P reform might occur? It was in Israel’s interest to offer some alternative to jihadist nihilism and nationalist victim-mongering. Instead, the post-’67 approach was leaving the P’s to their own devices until they got their act together– while Israel annexed parts of the West Bank de facto. Of all the alternatives one might have posed in 6/67, hasn’t this one been the worst? For Israel and its standing in the world? I honestly stopped reading after, like.. the 2nd paragraph. I think it wouldve been more worthwhile to cover the rallys against the Israeli occupation of Palestine held in Tel Aviv, London, Madrid, D.C., Sydney, South Africa, France, Tokyo, Denmark, Germany, Brazil, Norway .. hell even Indonesia!? sorry dahhhling, but that is the truth. and heres another one.. If a peaceful and free Palestine country existed, 80 percent of international security problems would be resolved. Apartheid, based on your comments, particularly your last sentence, it seems you always stop reading too soon. Your ignorance is glaring. And try to write without screaming, it’s getting tiresome. And if fairies and pixies sprinkled their magic dust everyone could fly. Let’s be realistic, a major component of their problem is their lack of unity. They are more concerned with tribal and religious allegience, then any real national. They would need to make peace amongst themselves first, which seems rather difficult in the arab world. They seem to only maintain order through force. TM – that is a major piece of writting and very impressive. Thank you. BTW The situation in 1948 of Israel’s birth had many simmilarities. The Arab nations refuesed then as well to seek a solution that allowed Jews a homeland. was Israel “born” in 1948? was Ireland born in 1921? Poland in 1919? France in 1944? Or was it restored in 1948? Remember our national history is longer than the other three combined. Great post and wrap-up. I was only a kid at the time, but I remember putting together my first scrapbook with press clippings about the progress of the war. Sadly I lost the scrapbook later in life. The rallies, against the mythical occupation of a country that doesn’t even exist, were a complete failure. The crowds were so sparse that the media ignored them completely. The protest in Italy was mainly against President Bush and not about Israel. Indonesia is populated by crazy Islamists so of course there was going to be a protest against Israel. These idiots have nothing else to do. Most human beings do not support barbaric terrorists. There has never been a Palestinian country and if Israel didn’t exist the Islamofacists would still be fighting against the rest of the world. And the Arab “Palestinians” would be calling themselves Jordanians and living in Jordan. Did you see the Economist a couple of weeks ago? The cover story was â€œIsraelâ€™s Wasted Victory.â€ I think that headline encapsulates European public opinion about Israel, generally speaking. The main issue for these authors is Israelâ€™s liberation of Yerushalayim, Judea and Samaria. Itâ€™s quite unnerving for many Jews to be told that Hebron, the location of the graves of our patriarchs and matriarchs, as well as Yerushalayim, our holiest city, need to be shared with people who want to kill us in order to achieve â€œpeaceâ€. â€œFearing an imminent invasion, Israel launched a preemptive air attack on Egypt in June 1967 and it achieved such staggering devastation that in just six days the war was won and the future of the Middle East was forever changed. But have our assumptions about the genesis of the Six-Day War been misguided? What was the involvement of the Soviet Union? Were the Israelis planning to use nuclear weapons? Were the Soviets? You must be kidding, right? First, the notion of a peaceful and free Palestine is a huge â€œif,â€ given the Palestinians propensity to disagree (i.e. kill each other) over basic political principles. Second, even if the Palestinians had a state tomorrow, radical Islamists will continue to kill people in the name of Allah. For example, the Abu Sayyaf thugs in the Philippines and the Harakat-ul-Mujahedeen terrorists in Kashmir would continue their campaigns. Third, the world is a very, very large place and Palestine and Israel are very, very small. There are a whole lot of problems out there in the big wide world. Isn’t all this Yom Yerushalayim stuff about a month late? Either my memory is going or the day passed a while ago already. good post. I sometimes wonder if the outcome would have been better if the Israelis slowed down the conquest of Judae and samaria into a 10 day war, More time for arabs to flee putting more pressure on King Hussein to have cut a deal. lol, “Apartheid”. read a f*cking book. Here’s a letter I wrote to the BBC this last week. Since there’s no chance of their ever running it, I’ll post it here. The BBC website and radio broadcasts have run several pieces surrounding the 40-year anniversary of the Six-Day War. The coverage has been roundly negative, and in some cases downright misleading. If an individual were to base their knowledge of this event solely on your coverage — as unfortunately many will and have — he or she would be forgiven for thinking that a militarily omnipotent US protectorate started an aggressive, unprovoked war in order to steal its neighbors land and subjugate the local population. Such an individual would have no inkling whatsoever that this supposed aggressor was in fact an isolated country with indefensible borders and no allies willing to defend it, that this tiny country exhausted diplomatic channels in an effort to avoid war, that her government responded in accordance with international law to hostilities initiated by hostile neighboring countries, and that her governmentâ€™s peace entreaties were arrogantly rejected by the very countries she had defeated. Indeed, an uninformed reader of your coverage of events would be forgiven for thinking that the the Six-Day War was fought between Israel and the Palestinians, rather than between Israel and the combined armies of Syria, Jordan and Egypt (with help from Iraq and Saudi Arabia, and with the support of the Soviet superpower). While the Palestinians as a distinct polity can hardly be said to have existed in 1967, their narrative nonetheless dominates your coverage of the war. While it is more than appropriate to point out the lamentable situation of the Palestinians in 2007, the question remains: In June of 1967, what choice did Israel have? And while it is easy to lay the blame for the Palestinians’ plight at Israel’s feet today, the question calls out for an answer: If Israel had not been victorious in 1967, would there today be an Israel to blame? Tom’s right. Israel should have imposed a victor’s peace. It couldn’t have been any worse than what’s happening now. It has all been because of Israel’s (and Jews’) deep-seated desire to get the gentiles to like us. It’s like Sally Fields at the Oscars. This was symbolized by Moshe Daya’s inexplicable decision to return control of the Har ha Bait to the Waqf after it had been liberated. This was proof that Israel was fully prepared to evacuate the newly liberated areas. If they don’t even care enough to keep the Har ha Bait, why should the Arabs not assume that they will be willing, if not eager, to give everything else up at the drop of a hat? Why bother to recognize Israel and make peace with it when you know that they are willing, without even a fight, to relinquish everything they have gained if you just say “We like you now?’. If Israel is that unsure of itself, the Arabs need only wait until Israel, desparate for anything resembling “peace”, will jettison the whole kit and kaboodle for one flirtatious glance. That is, essentially, what happened at Oslo. In retrospect, the only thing that is hard to understand is why the Arabs didn’t try the “phony peace” gambit earlier. Yeah. A longer war allowing more Arabs to flee would have been a much better outcome. Although if the recent fatwa making it a religious crime for Muslims to leave “the blessed land”, issued in response to the thousands of Pals, mostly young men, who are stampeding to the exits is any indication, maybe the Pals will solve the “Palestinian problem” themselves. Of course, the terrorists throwing each other off of buildings doesn’t hurt the demographic balance either.